The Carolingian Westwork and Civitas Corvey comprise an early Christian monastic complex. 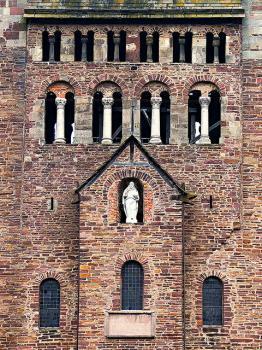 It has the oldest surviving example of a Westwerk, a massive, tower-like western front typical of Carolingian churches. 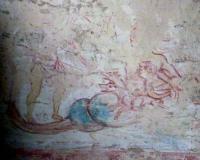 It also shows a rare cycle of mural paintings depicting classic mythological subjects applied to a religious building. The complex lies in a rural area and was built between between 822 and 885. Its name, Nova Corbeia, derives from the mother monastery Corbie in the North of France. It’s always annoying when a new WHS just “pops up” in an area that you thought covered already long ago. 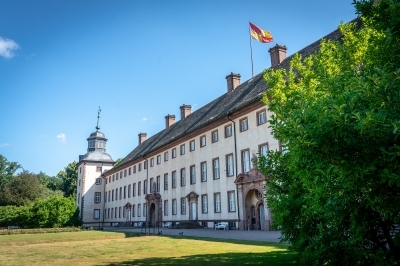 Corvey lies quite close to the WHS of Hildesheim, Fagus Factory and Bergpark Wilhelmshöhe. Sites that I not need to return to. And the description of Corvey isn’t that appealing either – I was surprised that it made the List earlier this year. However the warmest November day ever got me into action, and I drove out there for a day trip. The site has a large (free) parking lot, where some 20 cars were already parked when I arrived. From there you enter the main gate of the baroque monastery complex. While reading the nomination dossier, I found the distinction between the (inscribed) medieval remains and the “modern” monastery puzzling at times. The difference is easy to see in their architectural style however, and I was attracted to the massive Westwerk immediately. It has a separate entrance: the church behind it is still in use as a parish church, and you pay only 0,80 EUR to get inside this way. But I hadn’t driven for hours just for a 10-minute visit: I wanted to join a guided tour to come to grips with what this WHS is all about. There are 3 tours a day (at 11, 12 and 15h), leaving from the museum shop at the monastery. The 12 o’clock tour is labelled as “World Heritage Tour”, so I opted for that one. It focuses on the Westwork and the medieval Abbey, and skips the baroque monastery. Entrance now costs 6 EUR to the monastery, 1 EUR to take photos and 3 EUR for the tour. As I had to kill an hour before the tour started, I looked around the interior of the monastery by myself. It’s not an active monastery anymore (the region became Protestant long ago): it’s privately owned by a Duke and serves as a palace museum. Its corridors and rooms are pretty barren. The museum exhibitions show a few original stones from the medieval Abbey, and further alight the role of St. Vitus as patron saint. Due to his relics being brought here, the Abbey became a major pilgrimage center in the Middle Ages. The display of relics was a way to popularize Christianity in this region inhabited by barbaric Saxons. The image of St. Vitus is a common sight at Corvey, whether he is being cooked in a pot or with lions licking his feet. There’s also a large statue of him in front of the Westwerk. Finally it was time for the guided tour. If you can understand German well, I would heartily recommend taking this one hour Themenführung Welterbe. The female guide has a detailed story to tell. I learned a lot more than what I had gathered from my web research beforehand. Definitive clarification of the meaning of “Civitas” in the site’s name for example: it refers to the Medieval Town of Corvey, which remains are now hidden under the baroque monastery complex. At the end of the tour, the guide tells about what becoming a WHS has meant to Corvey. It has been a long and expensive process. Now it’s a mixed blessing: they’ve seen a 30% increase in visitors since the designation, but find it difficult to keep up with the Management Plan. Corvey being split between two owners (the Duke and the Catholic Parish) doesn’t make it easy. The site closes between November and April, both for financial and conservation reasons. You might be able to enter the parish church during services in the winter months, and I also saw a Christmas fair advertised. I visited the Carolingian Westwork and Civitas Corvey in the summer of 2018 when I drove from Belgium to Berlin. I visited the site on my own without a guided tour. There wasn't a whole lot available in English and I couldn't tell if there were any English language tours or guidebooks available. The interpretative tools available for non-German speakers was rather slim. It was one of the least accessible sites I had visited in all of Germany (and I have visited most of the German sites). I spent about 2 hours exploring the grounds and taking photos. At least the entrance fee was affordable. This site is probably only going to be of interest to local school groups and world heritage site completists. The site was add to the World Heritage List in 2014 while I was in Germany, doing a trip to see all of the WHS's, so it was good timing and I was grateful it didn't happen a few weeks later or I might have had to go back again! The two parts of the site are quite different. Although the Carolingian Westwork is arguably more significant, I actually preferred the Civitas Corvey side of things more. There is a lot to see and it has been well maintained. It took me much longer than I expected to walk through and see it all. It probably would have been nice to have a guide but there is a considerable amount of information available in English. To get there, I caught the train to Hoxter and then just walked (mainly along the river) which was a pleasant and easy enough stroll. I visited this WHS in November 2014. From November to end of March, this site is only open during weekends but I was lucky to visit when the "Schloss" hosted a small Christmas market. If truth be told, I enjoyed the Christmas market much more than the site itself. The special tour organised during the Christmas market weekend was 6.50e but there isn't much to see and still I believe that such a site is more of a national heritage site and to me it lacks any OUV. The Westwork is the "top site" to see but still it's not a spectacular site. This was the last remaining German WHS I hadn't seen and as such it will still be dearly remembered, however I don't think I will be returning any time soon. Given Germany’s run of success in gaining inscriptions and with Corvey up for consideration in 2014 it couldn’t really be missed whilst we were in the area! But does the list really need yet another example of Carolingian Architecture? It already has Aachen, Lorsch, Mustair and Reichenau. That is not to gainsay the historic significance of the Westwork but not everything which is “important” should become “Welterbe”. As Ian has stated in this review, the site is situated a couple of kms outside the town of Hoxter. After its Mediaeval heyday the Abbey had a chequered life and, apart from the Westwork, the extant buildings all date from the late 17th/Early 18th Centuries. 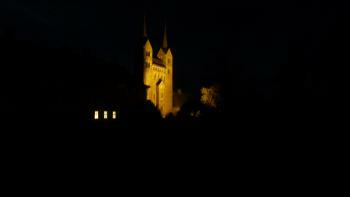 After the Napoleonic wars the Abbey passed into the hands of the Landgrave of Hesse-Rotenburg. The site today is owned by the Ducal family of Ratibor who market it as a hotel, conference centre and for weddings (2 whilst we were there!!). 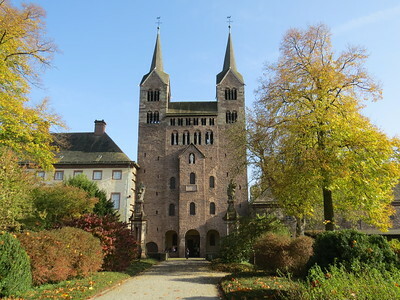 The Abbey has a split personality consisting of the Carolingian Westwork fronting a very baroque church and joined to the buildings of the Schloss. 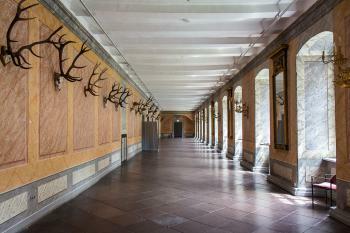 As you enter the grounds of the Schloss you will be directed past the restaurant to the Castle and museum – entrance 5 Euro. As far as we could see, this included entry to the Abbey from the inside of the Schloss (the Landgrave ensured he had a direct entrance!). We however made our way straight to the Westwork and entered the Abbey directly for 0.80 Euro – without the right to enter the Schloss of course. The first sight is the front of the Westwork (whose spires however look to have been reconstructed). Then the arcaded entrance where you pay and which leads through to the Baroque church. Finally it is important to climb the stairs in the right hand corner after you enter in order to see the main hall and the frescoes. These are very faint and cover a very small part of the interior - it was particularly interesting to see frescoes in a Christian church portraying the Odyssey (Odysseus facing Scylla and Charybdis - Photo). You need to refer to the interpretive drawings in order to make out what is happening! So, that is it. It isn’t quite clear from the documentation I have read, whether ONLY the Westwork element is being nominated with, presumably, the accompanying Schloss as part of the buffer zone. The remainder doesn’t really seem to be part of such OUV as the Westwork has. The official title is “Carolingian Westwork and the Corvey Civitas”. As far as I can discover the “Civitas” refers to the carving on the Westwork which describes Corvey’s status “CIVITATEM ISTAM TV CIRCVMDA DNE ET ANGELI TVI CVSTODIANT MVROS EIVS” (“Lord, Surround this city and let your walls be their guardian angel”). But the title could imply that the whole of the original “civitas area” is being nominated. The Corvey Web site is very bullish about its chances “Corvey – on its way to becoming a World Heritage Site”. Well we shall see. For every great world city that I have visited in this World Heritage hunting malarkey I seem to have visited some previously obscure town that has never really troubled a travel agent or guidebook author. The fact that my train trip to see the Corvey Abbey outside Höxter drew a curious and friendly crowd indicated that I was very much heading to the later. The town itself turned out to be rather pleasant, lots of half timbered houses and some nice traditional restaurants and hotels, in fact it was the fact that this place had a budget hotel was one of the few reasons I ended up there as I had left my bookings a little late for some of the other cities in the area. Corvey Abbey actually lays a little way outside the town of Höxter; it was about a 20 minute walk past some rather large houses. Strolling around the compound of the abbey at night was actually a rather spooky experience. The Westwerk was brightly lit, but the wind moved the trees and cast eerie long shadows across its bold frontage. I managed a quick peek inside a few of the buildings, but on the whole I couldn't see too much. Investigation of the interiors online doesn't really lead me to think I have missed out on a huge amount as the highlights seem to be some fresco fragments and the standard array of locally significant ecclesiastical materials. At one stage this was a rather important abbey, however its decline started in about the 1400's and now I wouldn't say it had Outstanding Universal Value, but it is not something I am particularly knowledgeable about and maybe I haven't given it full credit. I quite enjoyed my evening in Höxter, it was a pleasant and friendly town and the abbey at Corvey was a nice place to head to. I don't really feel like I saw anything of particular significance and I'm not chomping at the bit to return and see its interior. I won't be surprised if it does make it onto the list, but I think that is more reflective of UNESCO's inscription process rather than this abbey's particular merits. Car: It's the easiest to get there by car, and let your navigation system lead the way. Public transport: Railway station "Hoxter Rathaus", from there a limited bus service goes to the stop "Corvey". Alternatively, take a taxi or walk along the Weser for about 30 minutes (2 miles).